We continuously develop new and powerful hardware fittings with a close eye on market trends and customer needs. We do not just supply fittings, but also package them in accordance with your requirements. Our engineering services and the exclusive fittings from our own production facilities provide the furniture industry with the appropriate answer to its multi-faceted needs. Find out more about our Free flap fittings. 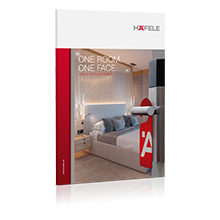 Get in contact with the Häfele industry advisers.